The newer luxury beach front Villa del Palmar Loreto resort opened a few years ago with a Rees Jones designed golf course. 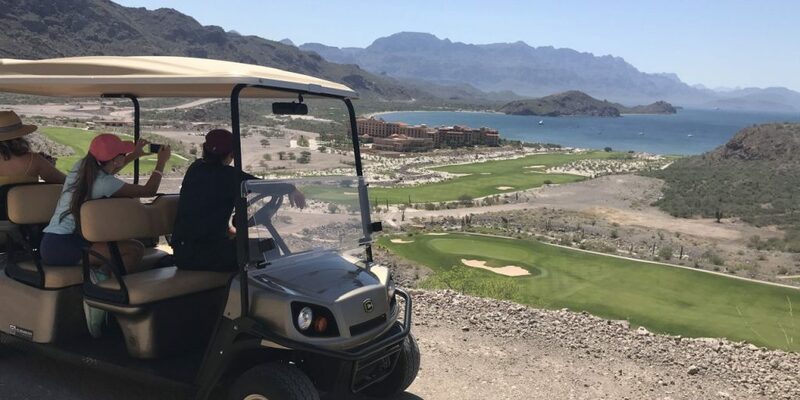 For a few years, the TPC Danzante Bay golf course offered 11 holes, until recently when seven additional dramatic holes were added to total 18 holes. There are 11 ocean-facing holes with some next to beach dunes near the property’s hotel, while others wind through the desert and up the dramatically chiseled canyon. This challenging course has four tees for all levels, and is the fourth international facility in the TPC network’s collection of championship golf courses. Villa del Palmar Loreto is a 188-suite resort overlooking Danzante Bay and Isla Danzante with three unique restaurants, five mosaic tiled swimming pools, a beautiful beach, two tennis courts, 39,000 sq. ft spa, miles of hiking trails, kayaks, paddle boards and snorkeling excursions. This luxury resort is part of the 4,200-acre Danzante Bay master-planned community is surrounded by the Sierra de la Gigante mountains and protected aqua marine coastline.